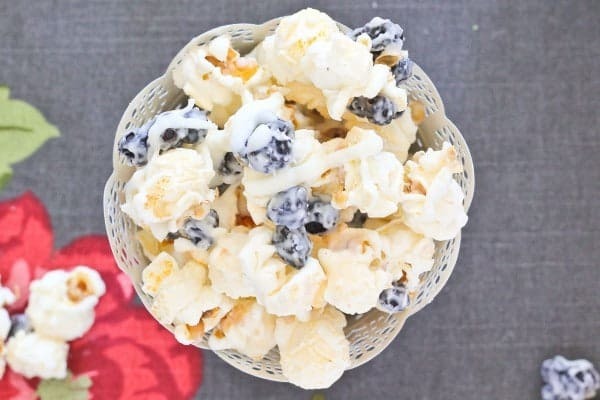 Blueberries and Cream Popcorn is hard to resist. What a unique treat to make for your family! The fun thing about popcorn (other than the fact that it’s the best food on earth) is that you can pretty much do anything to it. It’s a blank slate waiting to be decorated with any food you’re craving or even just whatever you have in the house. Sweet, savory, salty-sweet, spicy-sweet, whatever you want. The only thing you’re limited by is your creativity. So get creative! 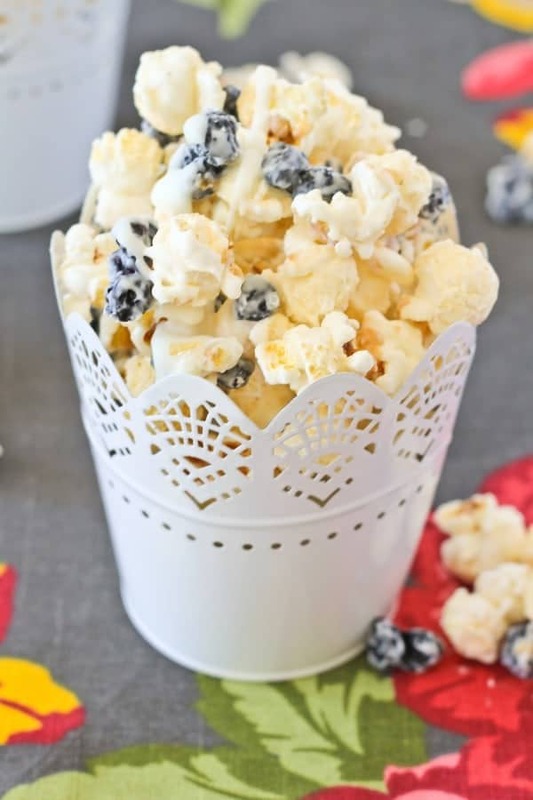 I seem to gravitate towards sweet popcorn flavors like Cinnamon Toast Crunch popcorn or Brownie Brittle popcorn, and this recipe is no different. I used dried blueberries (I got mine from Costco!) and white chocolate. And popcorn! That’s it! As always, I use mushroom popcorn for fancy popcorn flavors like this one. It pops up really full and is a great vessel for whatever toppings you are adding. Preheat your air popper for at least 2-3 minutes to minimize the number of unpopped kernels. Remove any unpopped or barely popped kernels. I know I say it every time (hello, yes, I am a broken record), but it is SO SO SO important! Consider yourself warned. I am not to be held responsible for any expensive visits to the dentist. You’ll have this popcorn made in less than 10 minutes. You can start digging in right away, but I’d recommend letting the candy coating or white chocolate harden before chowing down. One more note – if you prefer to use fresh blueberries, I have a couple tips. Wash them and dry them completely or you’ll have soggy popcorn. 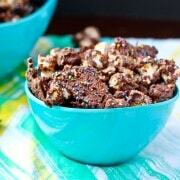 I’d sprinkle them on top after you’ve coated the popcorn with the candy coating. 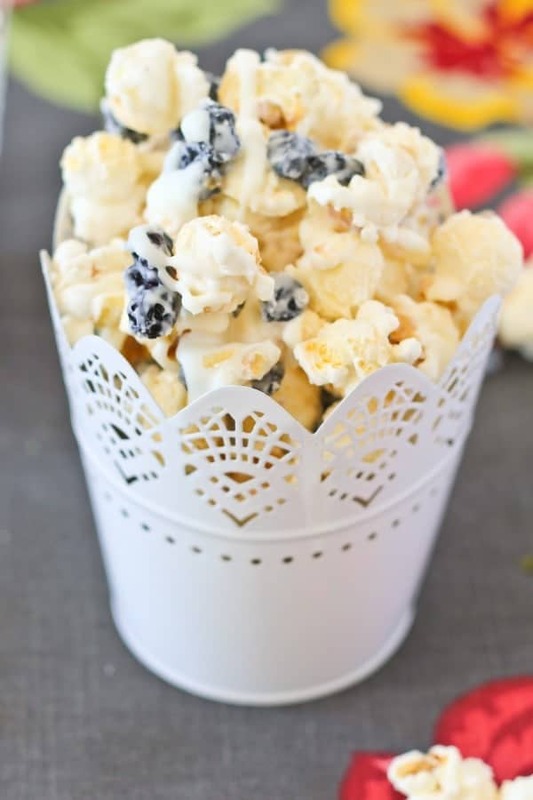 If you try to stir it with the fresh blueberries in there, you’ll end up with squished berries which will lead to soggy popcorn. Only use fresh blueberries if you’re going to eat it all immediately. Long story short, use dried. Not fresh. Save those for snackin’. Or muffins. Or pie. 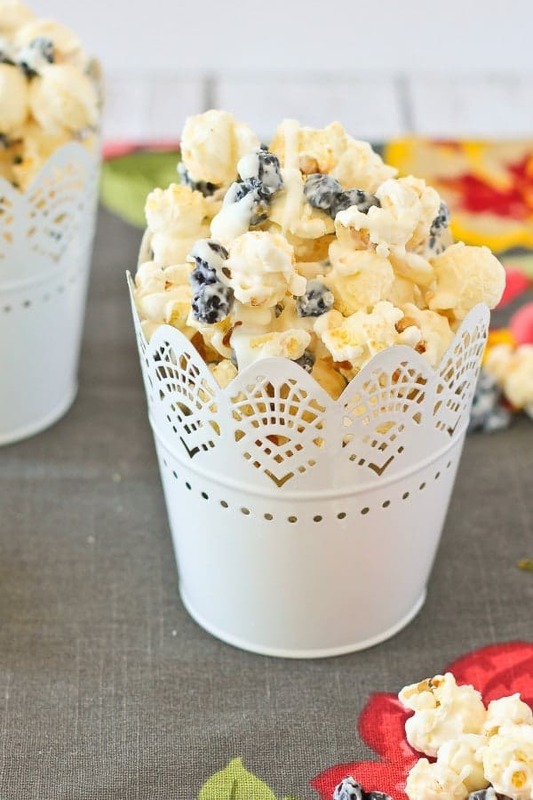 Are you a popcorn-aholic like me? 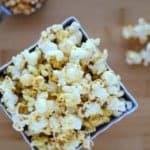 I have you covered with over 50 great popcorn recipes! I developed this blueberries and cream popcorn recipe for Food Fanatic. This is genius! I maked it. Thank you for sharing. I have such a weakness for sweet popcorn flavors too! Love the blueberries and cream – so fun and creative! This is genius! I never would have thought to put blueberries on popcorn – dried or otherwise. And the white chocolate is perfect! What a fun treat! Perfect for movie night!!! Yassssssss I might be having this for dinner.